Price Range: $255.00 to $355.00. Posted on March 25, 2013 by Charlie Minato of halfwheel. Fresh off the release of the 7 x 70 barberpole Ogre, Asylum Cigars is adding the Asylum 13 Corojo, a Honduran puro that will debut in April in 5 x 50 and 6 x 60 forms. Andrew Nagy broke the news of the newest cigar from Christian Eiroa and Tom Lazuka last week, which sees Eiroa get back to the family’s roots, Corojo. 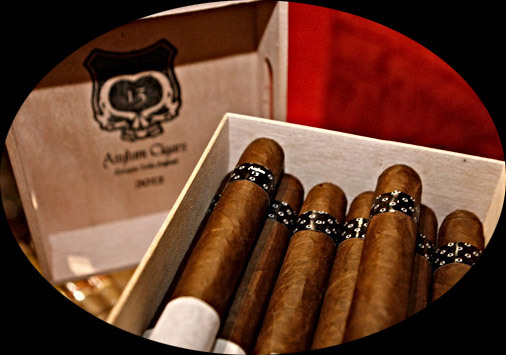 Asylum 13 Corojo will be made at Tabacos Rancho Jamastran in Honduras. Eiroa reiterated to halfwheel that both a 70 and 80-ring gauge version of the Asylum 13 Corojo are in the works.